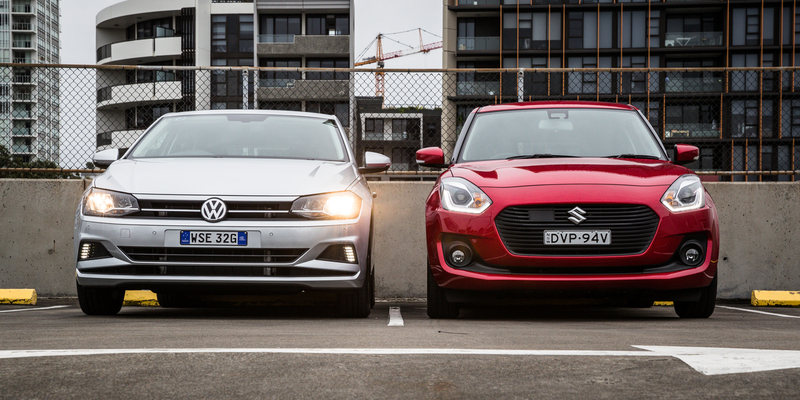 The Suzuki Swift and Volkswagen Polo account for more than 20 million global sales between them – and that’s not counting the Japanese city car’s 1980s/1990s predecessors that had different names around the world. Swift is the right word to describe the little Suzuki’s rise to six-million units since it became a proper global model in 2005. The Polo has clocked more than 14 million sales, though it’s been on sale since 1975. Locally, it’s traditionally been a no-contest between the duo. The Swift has at times enjoyed a six-fold sales advantage. Yet in 2017, the Polo stopped a run of 12 successive defeats by edging its rival – by just four units. However, the Swift was clearly hit last year by the transition from third- to fourth-generation models, and to May 2018 the Suzuki had nearly doubled sales compared with the same period last year. Volkswagen’s latest Polo is even fresher, having only been released earlier this year – and with only two variants that include the 85TSI here. At $22,990 drive-away until at least 30th September 2018 (the offer has already been extended from the end of June), the Polo 85TSI is priced exactly the same as the GLX Turboversion of the Swift. Planets align perfectly under the bonnet, too, as each city car is powered by an engine with three cylinders, 1.0-litre capacity, and a turbocharger. The Polo 85TSI and Swift GLX Turbo may be identically priced, but the parity quickly ends when comparing standard goodies. Suzuki has crammed kit aplenty into the GLX. Features the Volkswagen fails to match are extensive: 16-inch (polished) alloy wheels, keyless entry and engine start, LED headlights and daytime running lights, fog lights, digital climate control, privacy glass, adaptive cruise control, lane-departure warning, high-beam assist, paddle-shift levers, and navigation. Factory map guidance is a surprising omission for the Polo, though at least it offers Apple or Google Maps via smartphone integration. That’s not an advantage, as the Swift also provides Apple CarPlay and Android Auto compatibility, though the 85TSI isn’t without its one-ups. These include one-touch electric windows front and rear, auto-dimming rear-view mirror, heated side mirrors, tyre pressure monitoring, rain-sensing wipers, a slightly bigger infotainment touchscreen (8.0 inches), and proper auto headlights (unlike the Swift, they don’t need to be left in ‘Auto’ to turn off). Welcome touches, though the GLX Turbo’s extra features are bigger-ticket items, especially rare-for-the-segment adaptive cruise. The Polo does offer it – and it’s part of a Driver Assistance Package that’s reasonably priced at $1400 (and the only option, metallic paint aside, available for the 85TSI). In addition to allowing the 85TSI to match the GLX’s adaptive cruise and electrically folding side mirrors, the pack gives the Polo driver aids not even available at extra cost on the Suzuki: blind-spot detection, rear-cross traffic alert, front and rear parking sensors, passenger-side mirror with dipping function, semi-automatic parking system, and a parking AEB system called Manoeuvre Brake. Our duo is otherwise matched for cloth seats, leather covering for the steering wheel, gear lever and handbrake, rear-view camera, fatigue monitor (called Weaving Alert on the Suzuki), and autonomous emergency braking. Both charge $500 for metallic paint. The Swift is available with a contrasting black roof for $1000, though only with a dark-grey metallic body colour, whereas other markets offer more options. The new Polo has followed the grow-every-generation trend. The new Swift hasn’t. Nudging ever closer to the Golf, the smallest VW in Australia (the Up! is still sold elsewhere) has added 81mm to break the four-metre-long mark (4053mm to be specific). Suzuki, in contrast, has clipped the Swift, even if by only 10mm to register 3.84m nose to tail. Both models feature widened bodies and lowered roof lines, though the Swift still sits nearly 1.5m high as part of a design that once again evolves its successful 2005 styling. Volkswagen’s dimensional changes target increased cabin space primarily, with all but 3mm of its extra length going into the wheelbase that’s longer than that of a Golf Mark IV (1998–2004). And with an extra 10cm between its axles, it’s no surprise to discover more rear-seat leg room in the Polo. There’s some extra head room, too, as the Swift’s sloping roof line means those in the back don’t get the same, generous vacuum above their bonces as front occupants. Knee space is still respectable in the Swift, and better than a Mazda 2, to compare another key rival. Head room isn’t tight, either, with Suzuki countering the latest Swift’s 15mm-lower roof by lowering the seating positions – 21mm at the front, 25mm at the rear. The rear-seat benches are comfortable in both cars, with good under-thigh support. Neither carmaker splurges on rear storage: no centre armrests, and only one cupholder between them (the Swift, which places one at the rear of the centre console). The VW’s door bins are larger, though, with the Suzuki’s shaped for bottles only. And the Polo provides two seatback pockets to the Swift’s one. A centre armrest doubling as a console bin leads the German’s storage win up front, complemented by a wide-access compartment ahead of the gear lever for smartphones, two (octagonal) cupholders, mini coin tray, and large door bins. The Swift also has two cupholders, though their positioning ahead of the gear lever isn’t as convenient. Its front seats are superb, though, offering a nice middle ground between sponginess and firmness, with good bolstering helping to create snug comfort. The Volkswagen’s are hardly uninviting; they’re just not quite as supportive laterally or as naturally contoured. If the Polo falls short of Golf cabin quality, it more successfully breaks the budget-car mould than the Swift. Cheaper plastics are expected in the city car category, yet the amount of hard, hollow and roughly textured materials in the Swift is disappointing, and prominent, especially the shiny plastic dash on the passenger side. The roof lining would be acceptable in a Third World econo-car, but not in a Swift competing not just against the Polo, but also the likes of the Mazda 2, Kia Rio and Honda Jazz. The Swift’s boot space also remains averagely sized at 242 litres. That trails the Polo’s luggage compartment by 109 litres – a difference that is obvious beyond a printed figure. The Polo’s boot – another area that eclipses the Golf Mk4 – is more practical beyond its bigger capacity, too, with tie-downs, boot light and a full-size spare wheel under the floor, whereas the Suzuki’s is a temporary spare. Glass touchscreens are the go here, adding a dash of class to both cabins. The Polo’s display is the more effective. Aside from being an inch larger at 8.0 inches, its response is faster and its presentation more sophisticated without being any less intuitive. A proximity sensor also cleverly brings up extra function options when your hand approaches the screen. It’s a default infotainment system more than good enough to prompt many owners to ponder the worth changing to an Apple or Android interface using App-Connect. However, this is a must if you want map guidance on the display, owing to the 85TSI’s puzzling omission of factory-integrated navigation. Although there’s some delay to a press of the Swift’s touchscreen, it’s a likeable interface with its home page split into four simple, multi-coloured quadrants: listen/call/nav/connect. A voice-command function is also included. Pairing is a quick process in both cars, and the audios provide a good level of sound quality for this pricepoint. A disappointment on the Polo is that wireless charging isn’t standard, but rather forms part of the $1900 Sound and Vision package (which also adds Active Info Display and satellite navigation). It’s also included with the pricier Polo Beats model. It’s never been suggested the Swift has been overweight, yet a new platform saves 30kg while also being stronger than before. So, while the GLX Turbo is the heaviest Swift variant, it tips the scales at just 915kg. That makes it 237kg – or 20 per cent – lighter than the 85TSI DSG. No surprise, then, that combined with its more compact size the Swift is enjoyably darty, feeling the nimbler city car both around town and around corners. Such is the sense of fun it constantly imparts that the little Suzuki encourages you to be a bit silly sometimes, chucking it around in the knowledge there’s a confidently planted chassis and good tyre grip beneath you. The steering’s response is best when working the Swift’s front end, as a disappointing lack of on-centre feel forces the driver to focus harder than should be necessary to keep the car from wandering in a freeway lane or on straighter country roads. The Swift’s suspension – with a class-typical rear torsion beam set-up like the Polo – can get jiggly across high-frequency undulations, and generally the Suzuki doesn’t absorb bumps as well at higher speeds as it does lower speeds. The Polo rides more firmly than expected for a compact Volkswagen, though it shares the Swift’s ability to adopt a dismissive approach to potholes and other sporadic suburban bumps. Its steering conforms to VW tradition with a lack of feel, but its light and effortless nature, and excellent straight-ahead accuracy, make it the better all-round rack here. Just don’t expect to have as much fun on the open road as the Suzuki. You’ll want the GTI-badged Polo (due August) for that, though the 85TSI provides sufficiently assured road-holding. Three-cylinder engines used to be the exclusive domain of ultra-cheap micro cars, though they are becoming increasingly prevalent in the city car class. The big difference is that they are more advanced units featuring direct fuel injection and turbocharging. 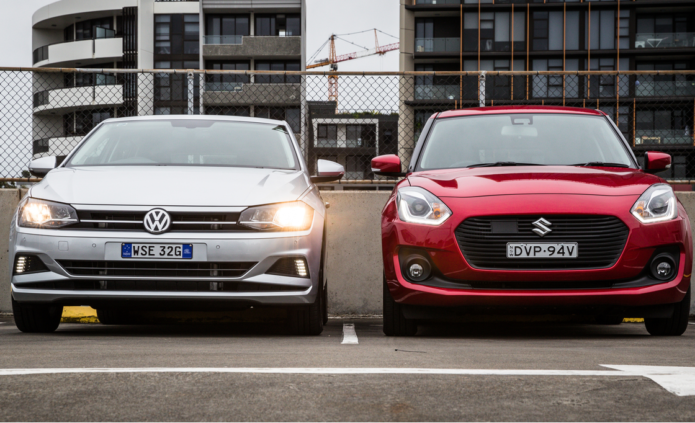 Volkswagen and Suzuki both opt for a 1.0-litre capacity, and there’s similar power: the Swift produces 82kW (at 5500rpm) to the Polo’s 85kW (between 5000 and 5500rpm). The Japanese tri-pot turbo’s torque is relatively low at 160Nm, though at least it’s conjured from just 1500rpm all the way to 4000rpm. The German’s peak torque arrives later and ends sooner – 2000 to 3500rpm – but it’s also chunkier, at 200Nm. Neither engine disappoints for performance. Compensating for lower outputs with significantly less mass to shift than the Polo, the Swift GLX responds to a heavy right foot with effervescent acceleration. Suzuki doesn’t provide performance claims, though, leaving it to the good ol’ seat-of-the-pants barometer to suggest the Polo (0–100km/h in 9.5 seconds) is the quicker car. It’s aided by VW’s quick-shifting DSG dual-clutch auto, though the trick transmission is also a hindrance to the Polo’s urban progress at times. Aside from the slight low-speed hesitancy long associated with the trick transmission (albeit improved), the seven-speed’s most notable foible is its delay in engaging first gear to get you underway after the stop-start system has fired the engine back into life at a junction or traffic lights. It encourages the cancellation of the stop-start system to avoid the issue, though at least it has the fuel-saving tech, unlike the Swift. The GLX Turbo again differentiates itself from other Swifts by featuring a conventional torque converter auto (with six speeds) rather than a CVT. That’s another reason, in our view, to stretch your budget to this variant if you can. However, both drivetrains could offer better initial response. The autos may differ technically, but they’re both calibrated with a bias towards economy – keen to upshift early when the engines sound slightly laboured. The Polo gives you the option to press a Sport button to enliven throttle response; the Swift provides paddle-shift levers. The levers are almost pointless, though, as the driver isn’t given free rein over gear choice. Try revving the engine to the 6250rpm redline, which it seems willingly happy to do, and the Swift shifts up a gear prematurely at 5400rpm. Arghhh. Suzuki’s conservative engineering also means third-to-second downshifts are frequently ignored. It’s a paradoxical party-pooper on a car so clearly designed to entertain. It also means less time to enjoy the Swift’s characteristic three-cylinder thrum – even more prominent than in the more refined Polo. With almost identical consumption and the same preference for premium unleaded, fuel bills can’t split these two. Suzuki’s servicing continues to be priced on the high side, though, and it’s enough to make it more expensive than the traditionally expensive Polo, albeit by a tiny amount. Whereas the 85TSI will cost a total of $2404 over five years with a capped-price program scheduled annually or every 15,000km, the GLX Turbo requires a $2452 spend at your local Suzuki dealer. It’s not ideal that Suzuki asks owners to service their Swift twice yearly. A bonus for Swift buyers, however, is that Suzuki extends its factory warranty up to five years (or 140,000km) if they complete the five-year service program. Volkswagen’s warranty is a rigid (and miserly in today’s scheme of things) three years. At least the Germans throw in roadside assistance free for that period, whereas it’s not offered by Suzuki. There are two distinct city-car personalities here, and many buyers are likely to be similarly different. If we were to use a school analogy, the Swift is the kind but mischievous, slightly scruffy pupil looking to have fun at every opportunity at the back of the class – and with whom all the kids want to be friends. The Polo is the class swot – studious, smartly attired and, if not as popular as the Swift, certainly hugely respected for its qualities. The Swift has always been an inherently fun car to drive, and nothing changes with the latest iteration. It tempts you to go around a corner that little bit quicker or to press its accelerator pedal that little bit harder. The GLX’s turbo triple is the clear pick of the regular Swift engines, while this variant’s equipment list is impressive. If only… There weren’t so many ifs. If only it had a better-quality cabin. If only parking sensors were available. If only the steering had better on-centre feel. If only it had a digital speedo. If only the paddles allowed proper manual control of the engine. And if only a manual gearbox were available. Volkswagen’s Polo misses out on its shot at city-car perfection, too. DSG gearbox issues still aren’t fully resolved, factory navigation is a poor omission, and the ride isn’t quite to the Golf’s plush standard. Yet, this is very much a Junior Golf in so many other respects. Perceived quality is class-leading, its refinement is also a segment benchmark, and it’s a well-packaged car with excellent cabin room and boot space for this size of vehicle. It’s a quick car for the price, too, while you can opt for a manual gearbox, add the worthwhile Driver Assistance Package, and still have more than $1000 in your pocket over the Swift GLX.